The footwork and accuracy of Michael Bisping was a factor as expected against Brian Stann, but it was actually his takedowns that led him to a unanimous decision victory at UFC 152. 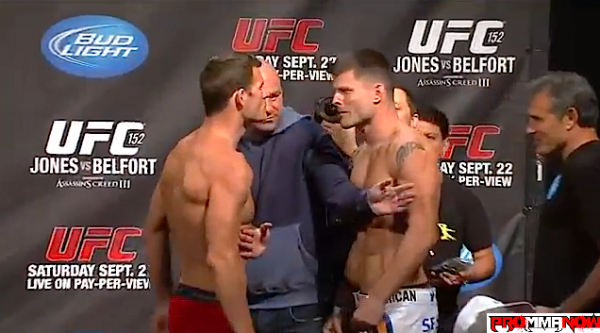 Bisping started the bout with what he does best, picking his shots and circling out of the range of Stann. Stann looked to throw with power but was unable to connect cleanly as Bisping continued circling out of trouble. After a brief clinch, Bisping landed a big elbow before stepping away and taking the center of the cage. Stann fought off two takedown attempts later in the round before rocking Bisping with a stiff right hand. A wobbly Bisping survived to the bell to close out a close first round. The jab of Bisping was key in the second round as he repeatedly beat Stann to the punch. Stann countered with powerful right hands over the top but gave up an easy early takedown. A sweep by Stann appeared to turn the tide, but Bisping was able to get the fight back to the feet and get back to work with his jab. Another late takedown punctuated a very good round for Michael Bisping. As the third round opened, Stann was still struggling to connect as Bisping landed the faster, cleaner shots, especially with his jab. Bisping’s takedowns again were a factor as the final round wore on. In the end it would be Michael Bisping (23-4 MMA, 13-4 UFC) with scores of 29-28 across the board, that advances one step closer to title contention in the UFC’s middleweight division.